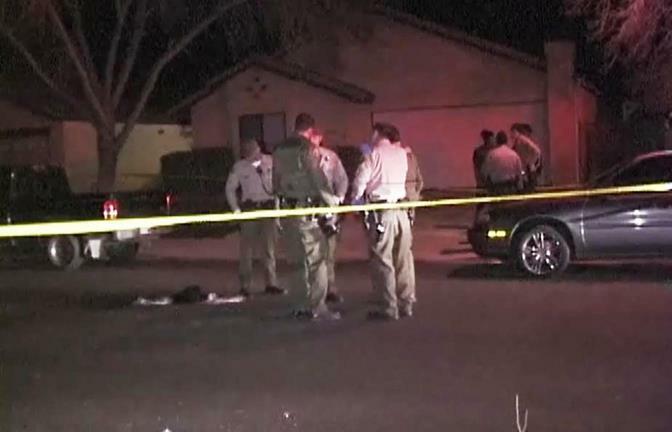 PALMDALE – A 17-year-old boy was shot in the upper torso and a 20-year-old man sustained blunt force head trauma after a group fight escalated into gunfire at a large Palmdale house party early Sunday morning, authorities said. Palmdale Sheriff’s Station received a call early Sunday morning [Feb. 2] of a large party, several fighting and shots being fired in the 3500 block of Avocado Lane, Palmdale. Multiple callers indicated that they heard gunshots. When deputies arrived they found one person, male age 17, had sustained a single gunshot wound to the upper torso. A second person, male age 20, sustained blunt force head trauma. Both were transported to local area hospitals where they are being treated for, what appears to be, non-life threatening injuries. A handgun was recovered at the scene, but it has not yet been determined if it was the weapon involved in the assault. It appears that a physical altercation which started at the party eventually escalated into gunfire. The incident appears to be gang related. A potential outstanding suspect is described only as a male black in his 20s, braided hair, wearing a blue sweatshirt and a beanie. Anyone with information is asked to contact the Palmdale Sheriff’s Station at 661-272-2400. 32 comments for "Teen shot at Palmdale house party"
I am praying for the these boys and their families. I pray for healing and peace. We need a more strict law regarding serious crimes; not just in the Antelope Valley, or California, but in the world in general. When you compare us to other countriest that have less violent crimes taking place, it is becuase their law means business. What I mean by that is…Well, i’ll just say this: research some of the prisons in other countries with a low crime rate and you can get a better understanding. In other news, these young kids are growing up with “no heart!” Be a man and “go toes” if you have too. If you lose, you lose. You cant win every fight, even Tyson got knoocked out. Weak-minded, weak-hearted individuals, and cowards use guns. Pulling out a gun because you are losing a fight is NOT “self-defense!” We need more fathers and father figures to “step-up & step-in, not “play daddys” who come around when he feels like it. Be active, teach these boys to become MEN and not cowards looking to guns for respect. You aint any “harder” with a gun than you was without one! having an “I dont care” attitude is just a defense mechanism; a cover-up to hide your real scared emotions, because when the smoke clears and either a barrel is kissing your check, or you are in prison kissing another mans cheek, the TRUE you will come out! Yes, exactly what we need, another large helping of bigger government, gotta love Ca liberals. Not quite sure of the tone of your response. If you are being sarcastic and/or calling me a liberal, I will say this: I am FAR from politics but my point is if you fear will, and can, be a preventive measure of crimes. If these cowards feared the prison or the consequences behind their actions, i can almost promise you crime rates would go down. Regardless of the economy, poverty stricken areas, etc, most of that is irrelelvant anyways. Literally, our entire system needs a makeover, from scratch, violent criminals should never be housed with non-violent offenders, the way the system is set up, there is no hope for people entering the judicial system to return to society a better person. I am going to base this on the fact that the majority of offenses these days are for non violent, victimless drug offenses, simple possession or under the influence (w/o any other crime being committed in combination) this should not be punishable by serving time in prison EVER!! This is where they learn to do the really bad stuff and when they are dumped back into society after having lost EVERYTHING they have, unable to get a job because their conviction labeled them felons for life, harassed by the police constantly, frowned upon by virtually all of society, really, to expect them not to use their new skills they learned to survive is simply hopeless, it is just an altered version of prison for them. We need less GOV, we need more community, we need to judge people by who they are individually and not categorize them into groups, if people commit victimless crimes, they should not be made criminals and thrown in with the wolves where surely they will be made criminals, they should only be labeled as criminals for life, unless we expect them to act like criminals for life. I know I am wasting my breath because society has been so conditioned, even the smallest of marijuana stories are filled with comments that basically label them trash. Society is sick, some people see it, some don’t, you have to be more aware of the big picture to know what I am talking about. “there ought to be a law” has played a big part in the success of stripping us of every freedom we once had, our children are the ones who pay, we brought the prison to ourselves, it is all a matter of severity. “It is no measure of health to be well adjusted to a profoundly sick society.” – Krishnamurti. You are absolutely right, from beginning to end! How easily we all jump to conclusions. Someone there had “blunt force head trauma” so its possible the person who pulled the gun did so in self defense and was under attack by someone using deadly force. Perhaps he shot an assailant who got too drunk and was beating people with a baseball bat. And of course they fled the scene – I would as well. Here in California/LA County they have an “arrest first, ask questions later” policy in which suspects (innocent or not) sit in jail for weeks or months, which in itself can destroy ones life, even if they are later found to be innocent and released. I myself have sat in jail as in innocent person wondering if I would still have a job, a home or any possessions when I got out. So desperate to get out, I took a plea deal for probation just so I could get out of jail right away and try and pick up the pieces of my life. So just remember… when you read a news story.. not everything may be as it seems. #2) Defense for trial is substantially higher cost. #3) The way the legal system is designed, if you choose to go to trial and are found guilty, your sentence reflects a severe punishment for wasting the courts time by going to trial. .
#4) Many people can’t afford bail so they have to spend months in jail waiting for trial and everyone in jail knows the conviction rate for someone who is being delivered to trial from jail is much higher then people who are out on bail and have access to the all the luxuries society uses to improve their appearance. Not only that but in jail, one is made to feel like the scum of the earth and this reflects the way they feel about themselves and it has a huge impact on a person, as well as the way they appear to the jury. It is all about revenue, more prisoners, more revenue, they do not care if people are innocent or guilty, they just want as many convictions as they can possibly get. (Though most people who have never been through it, don’t believe it until it happens to them). The streets are safe… we do not need our military to patrol the streets. Thats what our tyrannous government wants You to think is a good idea, along with gun control. Were more in danger from being infected by the melancholic propaganda that is making people think the world is so “ugly” and “unsafe”. A SHOOTING AT A HOUSE PARTY IN LANCASTER WEDNESDAY NIGHT! WELL PALMDALE DIDNT WANT TO STAY BEHIND! YOU KNOW CRIPS vs BLOODS!! LEDFORD vs REX!! Why are people saying “RIP”? The story said both people are recovering from non life threatening wounds. RIP means the people have died…which neither one has. They are both alive. Can people please stop posting post-mortem information? They are not dead. Maybe some of these people on here know something we don’t. Read carefully hunny, they’re saying R.I.P. to the victims that have been shot at parties before !! Rest in peace Kevin Tatum who was shot and killed at a house party in March of 2013 and I don’t know the other person they mentioned. They are talking about kids who have dies at parties in the recent past, such as Kevin Tatum. I know this teenager that said that he don’t go to parties, all because he heard kids saying “lets go shoot up at a party”. So, be careful there is kids doing it just for the fun of it. The word there is “kids”. Where are the parents? I’m not saying all parents are at fault but some are. Total negligence! It breaks my heart to see what Antelope Valley has become. I was there at the AV hospital this morning. Around 2am, the whole gang showed up for support of their member. Literally the whole waiting room got filled with them. Some really concerned others just basically laughing as if someones life handing in the balance is a joke. Really sad to see all these kids, for you can see were up to no good. Really sad to see these lives lost for really stupid silly things. Prayers for the families of both. Weren’t there any cops around to handle the situation? Cops are always trying to catch them. They should all have been arrested. Dang, it’s not even safe in the hospital. Arrest them for? Visiting someone who got shot? It is called a gang injunction. Basically means certain people aren’t suppose to hang out with others in certain areas. It also covers certain gestures, styles of clothing etc. I don’t think it is used much up here though. Irene, there is no reply button on your post so I will reply here. 1) you have to have an injunction in place to arrest them. 2) The areas covered by an injunction are small and very specific. Based on the need for common access, a hospital would never be included in one. So again, arrest them for what? Further don’t you think the police were looking for the shooter vs. looking for friends of the victims? As to gang injunctions they are not used in the Antelope Valley at all based on the nature of the gangs. What it’s become?!? This has been an on going issue for 20 plus years! If they didn’t dump all the ex-convicts here we may have a chance. Kids are not very bright sometimes. Sadly a lot of these kids are being raised “in the lifestyle” it’s what they see and all they know. Good grief, another one! What is the matter with people? Can’t they just argue with their mouth and walk away rather than fight and shoot? This is getting ridiculous up here. It’s not safe to go outside at all, anywhere. I hope they catch the low life and throw the book at him. The crime has not gone down up here. It’s gone up. As far as I’m concerned I’d feel better to have our military patrol our streets to help the cops and a strict curfew needs to be imposed on anyone under 21!!! I pray the injured will be ok.
You are incorrect. Crime is way done since the early 2000s. You just have easier access seeing what is going on. There is a curfew. 10pm for anyone under the age of 18.